England Test opener, Alastair Cook anticipates performing in such a way with his partner Andrew Strauss in their 100th outing, which will lead them to the victory in the second match against Pakistan in Abu Dhabi. The duo will become the only third in the history of Test Cricket who have represented their country in over 100 matches. England is on the trip to play three Test series against Pakistan who is hosting the series on a neutral venue in the United Arab Emirates (neutral venue). The visitors lost the first Test badly with a huge margin of 10 wickets at Dubai International Cricket Stadium on January 19th, 2012. The opening partnership was unable to produce the required results in the match which led the team to a horrible defeat. They had 10 runs stand in the first innings as the whole team was bowled out at 192 runs. The disaster continued in the second innings as they could manage mere six runs in the second innings which was folded on 160 runs. Pakistani off spinner Saeed Ajmal enjoyed 10 wickets haul in the match and England batsmen were unable to read him. The spinners captured 15 wickets in the match and the seamers contributed five as the visitors faced humiliation. 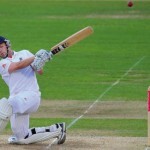 Strauss became victim of Ajmal on 19 runs in the first innings and Cook surrendered for three against Mohammad Hafeez. Both of the openers were sent back to the pavilion by the Pakistani fast bowler Umar Gul in his opening burst who restricted them to single figures. Gordon Greenidge and Desmond Haynes of West Indies hold the record of 148 Tests opening partnership by thrashing 6482 runs between them at an average of 47.31 with the best of 298. Marvan Atapattu and Sanath Jayasuriya of Sri Lanka have appeared in 118 Tests together, scored 4469 runs, averaging 40.26 with the best of 335. The Australian openers Matthew Hayden and Justin Langer are at no.3 while taking part in 113 matches, smashed 5655 runs at a superb average of 51.88 with the best of 255. The second Test against Pakistan will be played at Sheikh Zayed Stadium, Abu Dhabi from January 25, 2012 and Cook was sure that he will produce magical stand with Strauss in the match.